Congrats! You’re getting married! Now what? Here are some wedding photography tips and things to keep in mind before your wedding. Getting ready normally takes longer than you think! However, you do not need to have the photographer there the whole time. You will want me there for putting on the dress, finishing touches, and candids with the bridesmaids. I can also get photos of the reception and details while you finish getting ready. It's a good idea to have a small bag ready with the items you want for your detail photos in order to save time and to not lose important items. For example, this may include your rings, garter, earrings, bracelets, invitations, something blue, and shoes. Let me know if you want a “first look” with your dad and/or your bridesmaids as well. The ceremony can sometimes be nerve racking, but try relax and live in the moment! 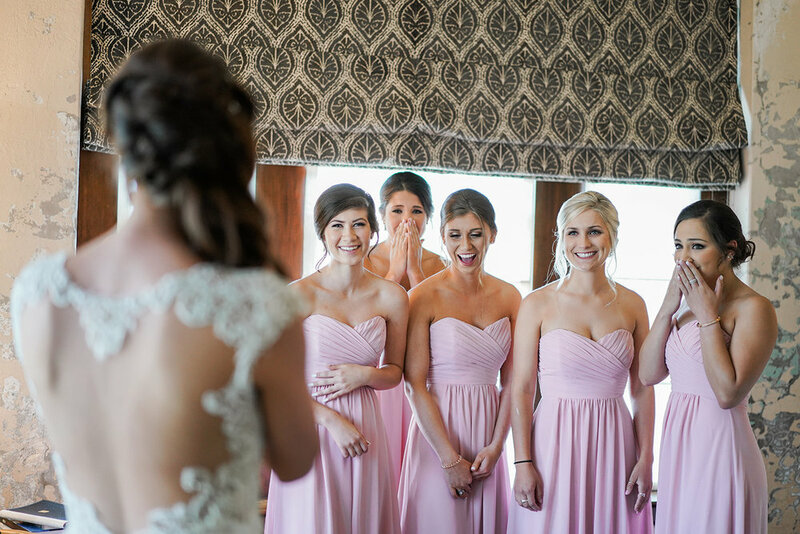 Here are some tips for you and your wedding party to get great photos. 1. Don’t forget to smile :) Have fun! 2. Walk slowly. Nerves can make you walk faster, but this is your moment so soak it all in! 3. You don't need to look at the camera the whole time as you walk down the aisle... candid shots are usually the best photos! 4. Have a long kiss because this is your first kiss as husband and wife! 5. Let me know an idea of how long your ceremony is going to be. I’ve had ceremonies last from 4 minutes to one hour and it gives me a good idea of how long I have to get different angles of the ceremony. 6. The ceremony starting time sometimes runs late depending on how long it takes the whole wedding party to get ready. Do not worry if you run a little off your schedule, this is normal for a wedding! With the traditional ceremony, the groom will see you for the very first time when you walk down the aisle and this can be very emotional and special! If you are doing a traditional ceremony, I would allot more time after the ceremony for wedding party photos, family photos, and bride and groom portraits. If you are doing a first look, you will have more time to take photos of just you and the groom and this helps relax some of your nerves. You will also have more time for photos of the whole wedding party. Both are great options and it’s totally your preference. You can’t really go wrong either way! This is totally your preference, but sometimes wedding guests get so excited that you are getting married that they stand up in the middle of your ceremony to take photos on their phones, Ipads, and cameras. This can sometimes get in the way of the photographer’s shots. It might be a good idea to have your officiant say something along the lines of please turn off your cell phones and keep them out of sight during the ceremony. Some photographers are very passionate about having an unplugged ceremony, but I’m easy-going and don’t mind either decision! Don’t worry about the photos and just have fun! Beforehand, let me know what traditional events you plan on having (first dance, bouquet or garter toss, cake cutting, etc.) and if you plan on having a send off. If you are having a send off, it’s best to walk slow and pause for a kiss midway when you walk out. Also, if you are having a sparkler send off, please don’t let the guests light the sparklers until you’re ready to walk out! I normally finish editing my photos in 5-6 weeks and I’ll send sneak peek photos to you the week following your wedding. I take hundreds of photos and edit all the photos that I give you. I will email you a link to your own personal online wedding gallery. From this gallery, you can individually download photos or download all the photos at once. You can share this gallery with wedding guests and you and your guests will be able to save and print any photo. You can either print directly from the site or from wherever you choose. I’m pretty flexible and don’t have strict printing rules! Outdoor photos tend to look more natural and beautiful! The best lighting is usually around 1-1.5 hours before sunset, which is called the Golden Hour. Keep in mind sunset varies greatly depending on the time of year. You may want to plan your ceremony when it is still light outside and not after sunset. For indoor lighting, the more light the better! Candles, white uplighting, and festoon (twinkle) lights always look great in photos. Don’t worry about your photos! I can work with the weather and this will give you more unique wedding day photos. Just incase, I always bring a clear umbrella with me in my car so you and your groom can take photos outside in the rain. Cloudy days still produce good lighting for photos and you don’t have to worry about the sun being too bright on your face. What if it’s crazy hot outside? We live in Texas, so this is expected! You won’t be able to tell because I can retouch any sweat from your faces. Bring handkerchiefs and water! Especially for the groomsmen, since they are normally very hot in their suits. I’ve shot some weddings where the wedding party brought a few mini fans outside to help cool off. We will be taking photos under the shade, so it won’t be too hot and the sun won’t be shining harshly on your faces. Cell: 832-746-2092 Call or text me anytime!